Mohamed Said Ramadan Al-Bouti was a notable Sunni Muslim scholar (“Shaykh of the Levant”). He was killed on 21 March 2013, during the Syrian civil war, reportedly in a bomb explosion though “many questions about the death” have been raised by videos of the scene. his family immigrated to Damascus when Al-Bouti was four years old.Al-Bouti was soon enrolled in religious education in Damascus. Following the outbreak of the Syrian revolution in March 2011, Al-Bouti criticized anti-regime protests and urged demonstrators not to follow “calls of unknown sources that want to exploit mosques to incite sedition and chaos in Syria He accused “International Masonry” and “Christian Zionism” of causing the events in Syria and the Arab world behind the curtains and called it “a hidden war against Islam” rather than a revolution. Al-Bouti was killed while giving a religious lesson to students at the Iman Mosque in the central Mazraa district of Damascus. The bomb attack reportedly killed at least 42 people and wounded more than 84. It marked the first time during the civil war a suicide bomber detonated explosives inside a mosque. Al-Bouti’s death is said to have removed “one of the few remaining pillars of opposition to the uprising.But who really killed him and why and what truly happened….? An armed terrorist group affiliated to Al-Nusra front confessed to the assassination of Sheikh Mohammad Said Ramadan al-Bouti at al-Iman Mosque in Damascus after it was ordered by the leader of the front, according to SANA. Terrorists confessing (SANA)”After that Sheikh al-Bouti criticized al-Nusra operations in Syria we were ordered to kill him due to a fatwa by the legislative general official of al-Nusra front , nicknamed Abu Khadijeh al-Ordoni, ” the armed terrorist group said in their confessions broadcast by the Syrian TV on Saturday. The terrorist group said it was planned to assassinate Sheikh al-Bouti at al-Hamidiyyeh Souk after he finishes a Friday sermon at the Umayyad Mosque while his car passes across the Souk. “The plan was changed after we get information that Sheikh al-Bouti addresses a religious lesson every Thursday at al-Iman Mosque so the assassination took place at the Mosque,” the terrorists said. They said that the plan of attacking Sheikh al-Bouti car by a person wearing an explosive belt was changed for fears that the car could be armored. The terrorists added that al-Nusra front did not adopt the assassination as it was strongly condemned and rejected by the Syrian people because the assassination targeted a religious figure and a big number of worshipers. On March 21, a suicide bombing targeted Sheikh al-Bouti while he was addressing a religious lesson at al-Iman Mosque. “After that Sheikh al-Bouti criticized al-Nusra operations in Syria we were ordered to kill him due to a fatwa by the legislative general official of al-Nusra front , nicknamed Abu Khadijeh al-Ordoni, ” the armed terrorist group said in their confessions broadcast by the Syrian TV on Saturday. Syrian security forces have arrested an armed cell which is responsible for murdering the Chairman of the scientists of the Levant, Sheikh Muhammad Sa’id Ramadan al-Bouty in April 2013. Al-Watan Syrian newspaper said that the Syrian state channel will broadcast the confessions of the terrorists, who committed the crime, on Saturday. The newspaper pointed out that the security forces have carried out an intelligence action to capture all the cell’s members, who implemented the assassination. Sheikh Muhammad Sa’id Ramadan al-Bouty was killed in a planned explosion while he was delivering religious classes in al-Eyman mosque in the center of Damascus. ذكرت “الوطن” السورية انه “من المقرر أن يبث التلفزيون السوري مساء السبت اعترافات الإرهابيين الذين نفذوا عملية اغتيال الشيخ محمد سعيد رمضان البوطي، بعد أن قامت الأجهزة الأمنية بعمل استخباراتي دقيق للغاية أدى إلى توقيف كامل الخلية التي نفذت الاعتداء وكذلك الخلية التي أمرت به”. 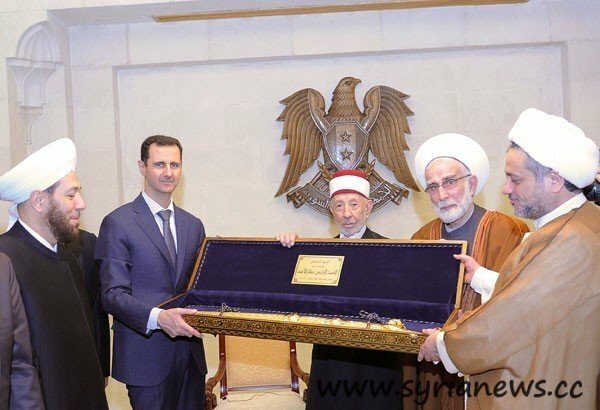 Syrian Prime Minister Wael al-Halqi said that Syrian authorities arrested killers of prominent Scholar, Sheikh Mohammad Said Ramadan al-Bouti. “The group that assassinated [Sheikh Mohammad Said Ramadan] al-Buti and tried to assassinate me has been apprehended,” Halqi told the Arabic satellite television station al-Mayadeen. Sheikh Bouti was martyred last March when a suicide bomber blew himself up in a Damascus Mosque. At least 41 people were also martyred during the attack. He also said that Damascus has shown some of foreign militants who are engaged in the Syrian fight, in an indication that several foreign powers are interfering in the Syrian crisis. On March 23, thousands of Syrians carried the coffin of the leading Syrian Sunni scholar Sheikh Mohammad Saeed Ramadan al-Bouti, who had been killed in a terrorist attack in the Al-Iman Mosque in Damascus along with his grandson and other 47 people. Grand Mufti Ahmad Badreddine Hassoun, whose son was also killed by terrorists several months ago, and Syrian Information Minister Omran al-Zoubi also took part in the funeral. The attack was not only an atrocious crime but also a blasphemous act. It took place when Sheikh al-Bouti was giving a religious speech to a group of Islam students, including his grandson. Al-Bouti, 84, was a retired dean and a professor at the College of Islamic Law at Damascus University and a worldwide reputed scholar. Following the deadly incident, Syrian President Bashar al-Assad condemned the act of violence, pledging that the crime would not pass without punishment. “A promise from the Syrian people — and I am one of them — that your blood, your grandson and the martyrs of today and all the homeland will not go in vain, because we will stay following your thinking to eliminate their darkness,” he said. Sheikh Al-Bouti was known for his anti-terrorism stances and his criticism of foreign-backed militant groups, whom he described as “mercenaries.” The previous week to his assassination, the late scholar said during his lecture, “We are invaded in every inch of our land, in our bread, in our lives, women, children sanctities and honor. We are today in front of a legitimate duty…which is the need for mobilization to protect the values, the homeland and the holy sites, and there is no difference, in this case, between the army and the rest of this nation,” he stated. One week after Al-Bouti´s murder, another Sunni cleric, Sheikh Hassan Saif al-Deen, 80, was brutally beheaded in northern city of Aleppo by foreign-backed militants, who reportedly decapitated him before dragging his lifeless body on the streets. They also planted his head on the minaret of the mosque where he used to preach. Sheikh Saif al Deen also had anti-militant views and spoke out against the ongoing war against the Syrian government. In a Facebook page belonging to militants, he was called “a collaborator of the chique in power in Syria” and threatened: “We will come to you; you will not escape”. Sheikh Hassan Saif al-Deen was in fact the last of a list of murdered religious scholars, which includes Sunni and Shia Muslim clerics as well as Christian priests. All these murders have been carried out by bloodthirsty terrorists, who are described as “democrats” by Western governments and media. The first of these victims was father Basilius Nassar, the priest of the Mar Elias Chapel in the town of Kfar-Baham, near the city of Hama. He was shot on January 25, 2012 by a militiaman sniper in the Citadel area while he was picking a casualty. The second was a Sunni cleric, Sheikh Mohammad Ahmad Aof Sadek, who preached in the mosque Anas Ben Malek in Damascus. He was one of the first scholars who warned against violence in Syria. He also spoke out against the Takfiri groups saying that they had no place among the Muslims. He was shot on February 25, 2012. Third on the list was Sheikh Sayyed Nasser, an Alawite cleric and the imam of the Alawite hawze (religious school) Zaynabiyya in Damascus. He died by a gunshot in the face near the Shrine of Sayeda Zaynab, the granddaughter of the Prophet Muhammad (PBUH). The fourth was a Syrian Shiite cleric, Sheikh Abbas Lahham, killed in May outside the mosque of Rouqayya (daughter of Imam Hussein (PBUH)), where he preached. He was followed by Sheikh Abdel-Koddous Jabbarah, another Shiite scholar, the following month. The latter was shot at the market, near the Shrine of Sayyeda Zaynab. In July 2012, at the beginning of the month of Ramadan, it was Sheikh Abdel-Latif Ash-Shami who was shot and killed in an atrocious manner: during the prayers in a mosque full of faithful by a rifle shot in the eye. A month later, the imam of the mosque al-Nawawi in Damascus, Sheikh Hassan Bartaoui, was murdered as well. In October 2012, some people found the mutilated corpse of a priest of the Greek Orthodox Church, father Fadi Hadadat, at Katana, in the province of Damascus. He had been kidnapped by militiamen who demanded in exchange for his release a ransom of 15 million Syrian pounds. Patriarch Abdallah Saleh of Antioch and Orient of the Greek Orthodox Church confirmed that he had been murdered by terrorists. In the last day of 2012, another Sunni Imam, Shaykh Abdullah Saleh, was assassinated in Raqa. In February 2012, Sheikh Abdel-Latif al-Jamili, a cleric of the Achrafiyye Mosque, was killed by shrapnel launched by militiamen in the courtyard of his mosque. In March, it was Sheikh Abed Saab, who led the prayers in the al-Mohammadi mosque, located in the district of Mazze in Damascus, who was killed by an explosive device placed under his car. It is worth pointing out that all these crimes were actually encouraged by some extremist Wahhabi scholars from Saudi Arabia. One of them, Sheikh Abu Basir al-Tartousi, said he did not regret the death of Seikh al-Bouti. “He was a liar, who all his life supported the rulers”, UmmaNews quoted him as saying. He hypocritically added that he regretted that “other Muslims had been wounded or killed”. The Imam of Masjid from the mosque al-Haram in Mecca, Abdul Rahman al-Sudais, openly celebrated the assassination: “He (al-Bouti) was one of the biggest imams of delusion. He was a Mujahid on Satan’s path. And this (the murder of al-Bouti) is a great joy for Muslims”, he wrote on its Facebook site. In reality, all the killed clerics were openly hostile to the rebellion or at least did not support it. Their assassinations were intended to terrorize the Syrian population who refuses to support the armed groups. This point becomes clear when someone reads the statements by the terrorists themselves. Shortly before the attack on the Faculty of Architecture of Damascus University, which killed 15 students, the leader of the Wahhabi group, Liwa al Islam, Haytham Al Maleh, published a statement on his page of Facebook, where he warned that “it is compulsory for the students from the University of Damascus to launch a campaign of civil disobedience. If they do not do so, their University will have the same fate as that of Aleppo”. It should be recalled that in the month of January, 82 students of the University of Aleppo were killed and 160 others were injured by rockets launched by militiamen. Interfaith tensions, which were unknown before the conflict started, are now increasing in the villages along the border between northeastern Lebanon and Syria. People living in these areas speak of an ethnic cleansing campaign carried out by rebels who are trying to set up a Taliban-style state. Some Shiites, who have family ties to Lebanon, have become fighters in order to defend their villages from the terrorists´ attacks. Shells fired by armed groups often land in some of these villages. Rebels in Syria have also burned and looted the religious sites of minorities, the New York-based Human Rights Watch said in January. HRW revealed that opposition fighters had destroyed a Shiite husseiniya – a religious site devoted to Imam Hussein (S), a great martyr in the Muslim history. A video published online showed rebels hoisting assault rifles in the air and cheering as the site in the village of Zarzour, taken by rebels in December, burned in the background. In the video, one man announces the “destruction of the dens of the Shiites and Rafida,” a derogatory term used against Shiites by Wahhabi fanatics. In the western Lattakia province, Human Rights Watch quoted residents as saying that gunmen acting in the name of the opposition had broken into and stolen from Christian churches in two villages; Ghasaniyeh and Jdeideh (in the region of Lattakia). A resident in Jdeideh reported that gunmen had broken into the local church, stolen and fired shots inside. Therefore, a reign of terror has been implemented in all the places that the Syrian and foreign armed groups control in Syria. Due to their incapacity to trigger a popular revolution against the government, these groups have resorted to massacres and murders. This explains why local residents flee their homes when their village or street fall under their control, or increasingly join the National Defense forces fighting the terrorists throughout the country. Al-Manar is not responsible for the content of the article. All opinions expressed are those of the writer’s not Al-Manar’s or its staff.